At 8:15 am today, the 10th of May in the space La Solidaria at Fernández Crespo 1813, various types of police violently kicked down the door and entered the space without a single order, without identifying themselves, threatening to violently assault anyone they found inside. Neighbors gathered around in solidarity to protest the proceedings in a neighborhood besieged by crack cocaine before the indifference and complicity of the police. The compañeros inside decided not to leave due to the violent threats, and during this the solidarity of the various people who gathered at the front of the door could be felt. Minutes later a lawyer arrived to document the irregular proceedings, identifying those found inside and declaring that it was not a seizure but a legitimate occupation. Later, after some provocations of a official who identified himself as a member of the department of intelligence and took photos of the faces of many compañeros, the police left. The early repression happened due to the mobilization today in defense of water and natural resources in the area. It has to be taken into account that “La Solidaria” is the venue for southern regional coordination against the mega-projects, and that yesterday there was an intensive planning activity for today’s mobilization. 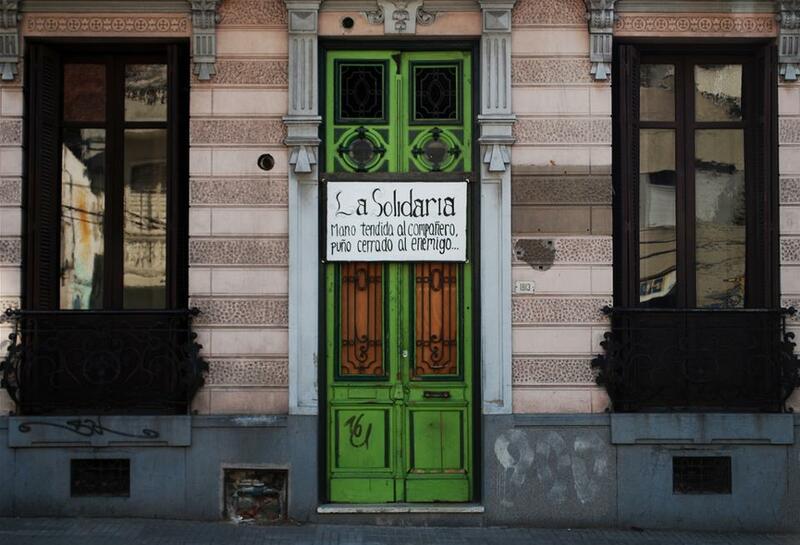 La Solidaria is an autonomous space which opened its doors in Feb. 2012, when a group of people decided to take the space to self-organize and carry out various activities, promoting values of solidarity, anti-authoritarianism, and mutual aid; using it as a tool to strengthen social struggle. In the space over the last year and a half many different types of activities have taken place such as; social Film Series and debates (throughout 2012), anti-patriarchy discussions and education (Mar. 2012), Independent and Autonomous Book Fair (FLIA, June 2012), Montevideo anarchist book fair (July 2012, with participation of international editorials). Global Independent Film Festival (Aug. 2012), as well as diverse workshops, many of which still happen today; on theater, creative re-uses for trash, artisan bookbinding, crafts with mate, tango, video and theater, and different talks/debates on various topics (syndicalist struggle, animal liberation, the environment, and ecological struggle). Different critical collectives with this reality take turns using the space to meet and work on collective projects, in this manner the lack of physical spaces for social organizations in Montevideo is filled. Within the same space the “Luce Fabbri Social Library and Archive” has existed for over 11 years which serves as the only collection of documents in reference to the social and labor movements in Uruguay and Italy between 1929-2000 as well as the Italian antifascist struggle in Uruguay amongst others, and is named after the deceased militant antifascist Luce Fabbri (1908-2000). The deeds to the house in question legally belong to the Evangelical Church of Germany (protestants). The “Luce Fabbri Social Library and Archive” has always functioned in this space with total autonomy and independence in regards to said church, as well as maintaining total autonomy from the La Solidaria space whose values of solidarity, mutual aid, and self-organization it shares. Since 2011 the Evangelical Church as a way to settle its debts with the State, has been handing over its space, after an agreement with the INAU with a ONG, which utilized the space as a place to hold numerous delinquent children, in a state of semi-incarceration, completely overcrowded, and in deplorable hygienic conditions. Due to this the same INAU was obligated to shut it down due to inhumane conditions. At that moment, a group of individuals sensible to the social reality reshaped the space until it is was left in inhabitable conditions and at the same time began its functioning as a space of social solidarity and as a living space for some comrades, giving it constant effort, time and money it its physical and social maintenance. Today La Solidaria is a nearly unique space in the city, a space where human connections can be created unmediated by money, profit or the interests of party politics. It is a space open to building another kind of human relations and connections with the social medium, from which to be able to build a society that is based on collective well-being and not on economic ambition, on solidarity and not on competence and egoism. On the struggle for our freedoms and not on submission to global economic politics. On a space of life and not one of dead laws. Because we believe that we must create our spaces ourselves, and that they should not be given to us by a god or the State, this is why we think it necessary to defend our own spaces. Let us not be indifferent, that they do not take from us what is everyone’s. No to the repression of La Solidaria and of any autonomous social project. This entry was posted in Communiques and tagged La Solidaria, Luce Fabbri, Montevideo, Uruguay. Bookmark the permalink.